Korean Orchid Awards retired on August 10, 2006 but all of our winners continue to be displayed with great pride. Thanks for making the web a better place in keeping with our purpose. 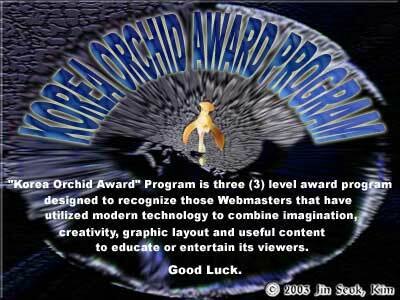 "Korean Orchid Award" Program is three (3) level award program designed to recognize those Webmasters that have utilized modern technology to combine imagination, creativity, graphic layout and useful content to educate or entertain its viewers. The "Korean Orchid Award" Program offers the GOLD, SILVER, BRONZE level awards to those sites that meet or surpass the current set of criteria set forth. The "Korean Orchid Award" Program realizes and understands the hard work and research that goes into a quality website. It is our goal to reward those sites, and their Webmasters for enhancing the quality of websites, thus making the World Wide Web a more pleasurable environment for all. Award applications are accepted ONLY from the 1st to the 15th of the month. Those who wish to re-apply, or to apply for an upgrade, should read the Process page. Thank you for your interest in the Korean Orchid Awards Program. Enjoy your visit, and good luck.